Global Shapers Hubs in Cairo & Giza have joined forces with AlMakinah to provide need-based scholarships to 25 women in Egypt that will help them launch their tech careers. The scholarship will provide them with an opportunity to join AlMakinah’s Gear Up Women Edition which aims to teach young women basics of web development. They’re now raising money in a crowdfunding campaign to make that happen. Global Shapers Community is an initiative of World Economic Forum that brings young minds between 20 and 30 years old in a network of hubs who work together to improve their local communities. The city-based hubs are led by these young leaders who take different initiatives in form of events and activities to generate a positive impact in their local communities. Egypt has three of these hubs in the cities of Cairo, Giza & Alexandria. AlMakinah is a Cairo-based programming bootcamp co-founded by Eman El Koshairy & Bahia El Sharkawy in 2015 that aims to produce production-tier software developers in a short amount of time. Egypt has one of the highest women unemployment rates in the world which currently stands at 24%. The female youth unemployment is an even bigger problem for the country with 45.7% of female youth having no jobs. There are different factors contributing to these high unemployment rates with one of them being the skills gap. A story published in Reuters in 2010 suggested that Egyptian education system needed an overhaul as it did not really prepare the students to join workforce. Not much has changed in last seven years and that suggestions is perhaps still valid. The country does not really perform well on international benchmarks, especially in STEM (Science, Technology, Engineering & Math) fields. Egyptian eighth graders ranked 38 out of 48 participating countries in the 2007 was Trends in International Mathematics and Science Study (TIMSS), a global benchmark for math and science competencies among fourth and eighth graders. One big part of STEM challenge is the under-representation of females. Inspite of female students being enrolled in different STEM fields as their male counterparts, they don’t make it to STEM jobs as often. AlMakinah has been making continuous efforts to change the status quo of computer science education. In their eighteen months of operation, they’ve trained more 60 coders, many of whom are now a part of Egypt’s booming start-up scene. As explained in the beginning of the story, Global Shapers Community’s Cairo & Giza hubs have teamed up with AlMakinah to launch the Women in Coding Grants Program. They believe that everyone should have an opportunity to learn so they want to offer 25 need-based scholarships to women who can’t afford to be a part of their programs otherwise. Anyone who is admitted to the program will be able to apply for financial aid and then AlMakinah will implement an intensive selection process for the applicants which involves a detailed application form and a Skype interview to ensure that the aid is allocated to those who need it most. They also consider the results of the screening assessment to make sure these applicants have the potential to pursue this career, whereby the aid would put them on the right track to excel professionally, Co-Founder of AlMakinah Bahia El-Sharkawy explained to us. Salma Abou Hussein who is Curator of Global Shapers Giza told us that it’s not very easy to find women who are majoring in CS or Engineering specializations. “What triggered the Cairo and Giza hubs of the Global Shapers Community (GSC) to start the campaign and collaborate with AlMakinah was the exposure of some of its members to the tech and education fields and their recognition of the obvious disparity between men and women. I, for one, struggled to find female participants who are currently majoring in tech specializations (CS or Engineering schools) to interview them for my research on the gender imbalance in the higher education system in Egypt,” she said speaking to MENAbytes. Hoda Hamad, Growth Hacker & Women Track Manager at AlMakinah struggled to increase the application rate of women for their program inspite of offering a fully-funded seat. AlMakinah does not only help women learn coding but also ensures that they’re absolutely ready to be a part of the workforce by offering them different soft-skills workshops. They’ve been partnering with local and foreign employers to help their graduates find jobs. “The Women Edition features a number of soft-skills workshops and networking events to augment the technical education. This is created to ensure that anyone who goes into the program graduates as a well-rounded, employable candidate. Historically, we have always considered anyone who enrolls into our programs as AlMakinah ambassadors not just graduates.” El-Sharkawy said. Some of their graduates have successfully secured jobs different local startups including Elves, Elephant Phunk & Bey2ollak. AlMakinah & GSC’s Cairo & Giza hubs could’ve tried to find a startup or corporate to sponsor the whole thing but the purpose of this campaign is not only to educate 25 deserving young women but increase awareness and encourage public dialogue on the issue as well. “One of the goals behind our campaign is to raise awareness on women in technology and increase public dialogue on gender balance in this field. A public crowdfunding campaign not only allows all people to contribute to the cause, but increases discussion around the issue. 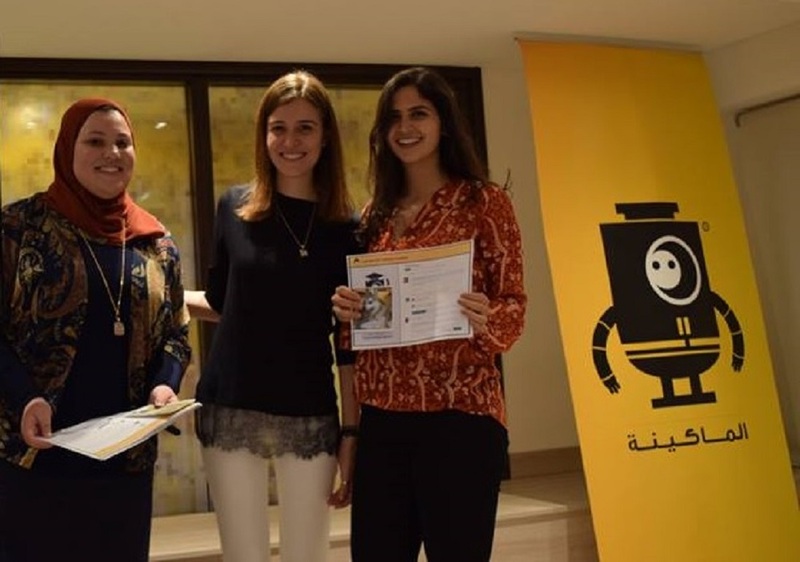 Rather than one single sponsor, the whole community can contribute to supporting a new generation of tech-savvy females.” said Sarah Mousa, Cairo Hub Curator. AlMakinah & Global Shapers Community’s local hubs have taken the first big step but they can’t do it alone. They’re giving you an opportunity to be a part of this change by contributing to their crowdfunding campaign. The campaign has been live for more than two weeks and has raised more than $1,180 at the time of writing. Its a great start but they need a lot more in to reach their goal of $5,500 in two weeks from now. Your contribution to their campaign will help young highly deserving females in Egypt to join AlMakinah’s ten day program that will take place from August 20 to 31st. This particular edition of AlMakinah’s Gear Up program is for female students only: as a means of encouraging and emphasizing female participations, and facilitating a learning environment that is tailored to various obstacles that may face women in STEM fields. Even if you cannot make financial contribution, please spread the word and share the link of their campaign with your network. If you’re a startup with female employees, you may take part in their #TenForTech challenge explained in the video below. We hope that AlMakinah & GSC’s local hubs are able to raise even more than the required amount by the end of campaign and others in the region follow their lead and replicate the idea to help more women take engineering jobs at startups all across the region.